During menopause, bloating can occur more frequently and for longer. This is because hormonal imbalances can cause the body to retain more water, which causes bloating. 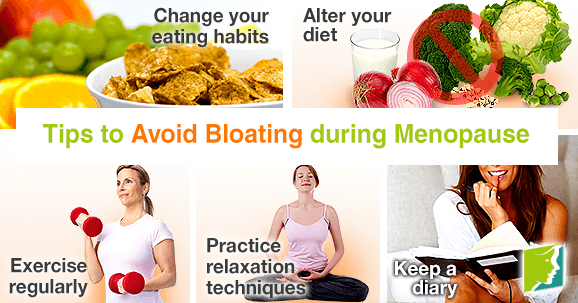 Fortunately, there are tips to reduce the severity and frequency of bloating and even prevent it completely. Your body can bloat more depending on your diet. For example, eating large portions quickly can exhaust the digestive system. Some women may not need to cut back on food, but divide it into smaller portions and eat more often. Eating six small meals throughout the day is one of the recommended ways to avoid this kind of bloating. Chew your food slowly; digestion starts in the mouth chewing your food into more manageable chucks gives the stomach less work to do. More gases are produced when food is consumed too quickly. Try to eat foods that will minimize gas like bananas, grapes, eggs, yogurt, and hard cheese. Cutting salt intake will also help, since salt causes the body to retain more water. Women who don't exercise experience bloating more often. Try to engage in at least 30-40 minutes of exercise daily. This will keep your system working efficiently and enable any blocked gases in the digestive tract to pass through. Sometimes, bloating occurs because the digestive system isn't working normally. If you can increase blood flood to the digestive tract and stimulate the intestinal action then it will break down food faster. Practicing stress-relief methods like yoga can improve blood flow to your whole body, resulting in a more efficient system. Everyone's body reacts differently to food, so note when you become bloated and look for patterns. If you find something that causes bloating, you can cut it out of your diet. Bloating is an unpleasant menopausal symptom, but can be easily treated. Follow this link to find out more about bloating and how you can avoid it. Are Bloating and Nausea Linked? Many women feel bloated after eating, and this is especially common after lunch. Click here for tips to fight bloating so you can feel your best.